Just home from Athens OH where I visited the Dairy Barn for its current show, an exciting collection of work from most of the people who have served as Quilt National jurors over the 35 years of that exhibit. It was special because the participants were asked to send three pieces: one from their earliest work, one of their work at the time they were jurors, and one of their current work. And most of them actually sent exactly what was requested! 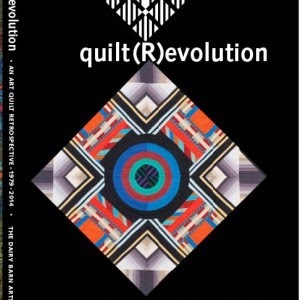 The too-clever title of the show, “quilt (R)evolution” is silly but accurate, because the quilts do clearly mark the evolution of the quilts-as-art genre, and it was quite a change from the status quo. Several of the oldest pieces are only a step or two away from traditional — and Ann Johnston’s 1979 quilt could have easily been made in 1879. For instance, Joan Schulze started by making a big quilt that was the California winner in the big Good Housekeeping Quilts of America competition in 1976 — I remember that, even though I wasn’t much of a quilter at the time. After it was photographed for the book (I think I have the book, too) her quilt and others were destroyed in a warehouse fire but after a long period of grieving she decided to remake it. The design was original, with a batiked landscape in the center, but its wide border is composed of the traditional Road to California blocks (she did shock the viewers by making them in different colors to extend the landscape — blue for the sky, brown for the earth). Subsequently Schulze developed her signature style of using images appropriated from the media in collage-like phototransferred and screenprinted compositions that remind me of Robert Rauschenberg. Katie Pasquini Masopust’s early quilt was a daring pentagon but executed in impeccably traditional craft from teeny calico prints. 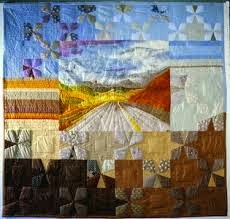 Subsequently she started incorporating easel-painted canvas into her quilt constructions. For those of us who have been tuned in to the quilts-as-art movement for a long time, the show is a great walk down memory lane. Fortunately all the pieces in the show still look fine (although Ann Johnston’s, used on the bed for decades, has faded dramatically into the muted colors of vintage quilts). For those of us who aren’t that familiar with the olden days of our little niche of the art world, the show will be an eye-opener: how far we’ve come in such a short time. Thanks Kathy. Retrospectives are usually interesting. It’s especially important for young artists to see where the “big names” started out. I remember seeing a Matisse exhibit where there was work that was tentative, reworked, some which looked like Cezanne others like Cubists. Through the exhibit you could see Matisse become the Matisse we love. I don’t know of other reviews of the show; maybe some of the fiber magazines will get around to it in future issues. 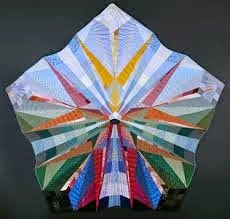 Critical review of fiber art in general, and quilts in particular, is hard to find. You are certainly right about the dearth of reviews of fibre arts, but it would indeed be a shame to see slip such an opportunity as this overview of the development of central makers in an important field. Thank you for your article and thoughts. I am certainly looking forward to receiving the catalogue – and hope, as you say that some magazines take up the chance to provide an in-depth review. Kathleen many thanks for pointing out this exhibition. It sounds a fascinating idea, and you make it sound an exciting show. Indeed I immediately ordered the catalogue. Reproductions in a book will never be a substitute for seeing and experiencing reality, but they are better than nothing. I am curious to see how folks have progressed over the years, especially having the examples all together too. Apart from your article here, are there any critical reviews of this exhibition which perhaps give an over view of the development of the medium? As someone who participates at the edges I am curious to read what other watchers and participants think of the progress that has been made in the field over those 35 years. I remember being so excited in 1981 when I was introduced to Elizabeth Gurrier in New Hampshire and seeing her three-dimensional white quilts and then seeking out other examples of art approaches to quilting through Fiberarts Magazine, American Craft magazine, and by seeing some pieces of work in craft galleries.